On Location by Jen Calonita /// I keep starting old series and then never finishing them. *eye roll emoji* I’ve been aiming to reread this series and finally finish it off. Continuing with book two! Crimson Bound by Rosamund Hodge /// Book Buddies pick for April with Cristina! Must read ASAP. The Love That Split the World by Emily Henry /// I was instantly attracted to this one and don’t know why I didn’t pick it up at ALA. It sounds right up my alley and the library was a good place to grab it. The Forbidden Wish by Jessica Khoury /// This has been on my TBR for a long time and I finally got it out from the library. It took forever for me to read for some reason, but I did eventually finish! Fables 1 & 2 by Bill Willingham /// I always stare longingly at this series when I visit the graphic novel section of B&N with Chris. I finally decided the library would be a great place to start. Where Futures End by Peevy Parkerhouse /// This is another one with minimal reviews but sounded intriguing. Noticing a pattern yet? I like to get my library books when I don’t feel like buying the book, or it feels risky because I’ve heard so little about it. The Flood Girls by Richard Fifield /// I became quickly obsessed with the cover of this book and finally saw a friend (Cassie) read it/rated it highly. I grabbed it on a whim at the library last week. 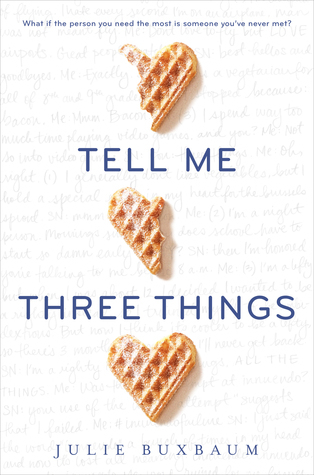 Tell Me Three Things by Julie Buxbaum /// I’ve been SO eager to read this! I’ve heard really fantastic things but for some reason I don’t want to purchase it outright yet. I’m hoping this is a book I add to my collection after reading it and loving it, thanks to the library. I’ve been doing this a lot lately. 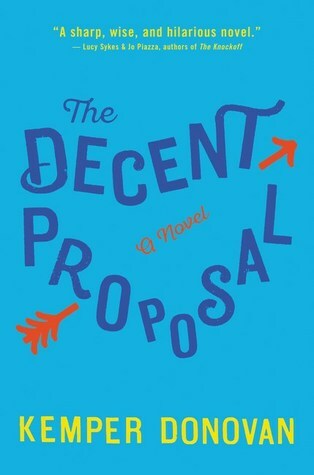 The Decent Proposal by Kemper Donovan /// I don’t remember how I came across this one, but I keep resolving to read more “adult” fiction. This one fit the bill and sounds really cute! From early reviews, it sounds like a rom-com movie in book form – those usually work well for me. Linking up with… Library Loot | Library Loot is a weekly event co-hosted by Claire from The Captive Reader and Linda from Silly Little Mischief that encourages bloggers to share the books they’ve checked out from the library. If you’d like to participate, just write up your post-feel free to steal the button-and link it using the Mr. Linky any time during the week. And of course check out what other participants are getting from their libraries. The Forbidden Wish is one of the reads that managed to surprise me this year! It’s such a lovely spin on the Aladdin tale that I’m very familiar with. I’m also excited for you to get to Tell Me Three Things. That one was a super cute contemporary read! The Forbidden Wish is definitely one that grew on me with each page! So excited for Tell Me Three Things, too! I have Tell Me Three Things on hold also!!! Can’t wait for it 🙂 And YES to Scarlett Epstein… I’m super-pumped to read that. I haven’t heard really anything about It’s All Your Fault either. No reviews or anything… that’s my kind of book 🙂 Also I love books with a premise like that. I’ve read a few and they’ve all turned out to be fun and cute. I can’t wait either! I hope it comes in soon haha. Lots of interesting books here! I’m intrigued by The Decent Proposal and will have to keep an eye out for it. Happy reading! Haha I know what you mean! I try to only request certain types of books and get them when I’m REALLY in the mood. I can’t let myself browse too much! Fun feature!! I usually include mine in my STS posts but I like that this is separate 🙂 I’ve been checking out a lot of books lately but haven’t been good at reading them on time…. at least I’m keeping them in circulation right? Haha. It’s fun to request and fun to browse! I have The Forbidden Wish from the library currently and want to check out Crimson Bound and Glass Sword again. Thank you! 🙂 I’m soooo bad about reading the books I check out – its a problem. Hopefully this feature helps haha. 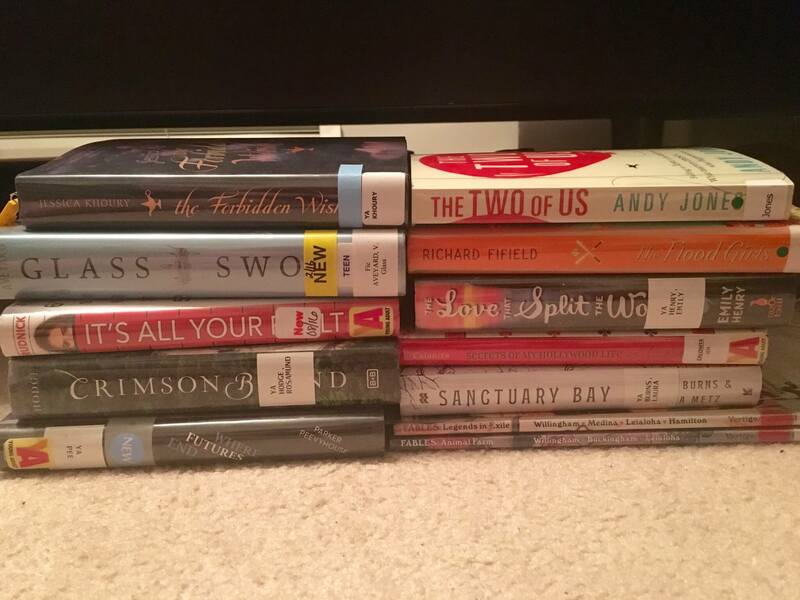 I love seeing your library love! 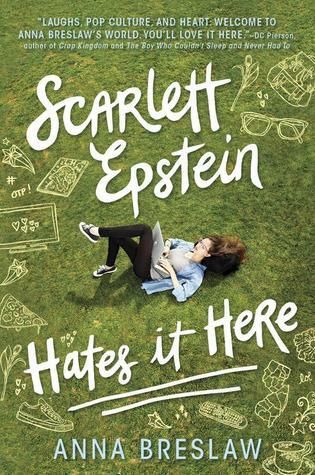 😀 I am very excited for my hold of Scarlett Epstein Hates It Here by Anna Breslaw to arrive as well. I enjoyed that one! It was cute.